Isabell explores paper in her art work, ranging from unique artists’ books to paper sculptures, installations, and collections of paper fashion and shoes. Her sculptural books tell a story, often created from discarded library and second-hand books. Many of her pieces include her own text and digital photography. She is active both in Edinburgh and in her workshop-gallery in Dumfriesshire, and produces work for exhibitions in the Uk and abroad. 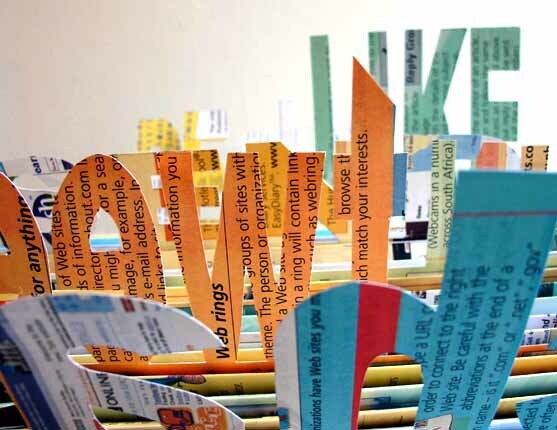 The sample of Isabell's artwork shown below is a close-up of her piece 'Social Media', which was created in 2013 as one of six commissioned sculptures made from old books for Question Quest in Dunfermline as part of the Andrew Carnegie Day Celebration and Scottish Book Week 2013. The event was also part of 'Previously...', Scotland's History Festival (a new festival celebrating Scotland's rich history and heritage).